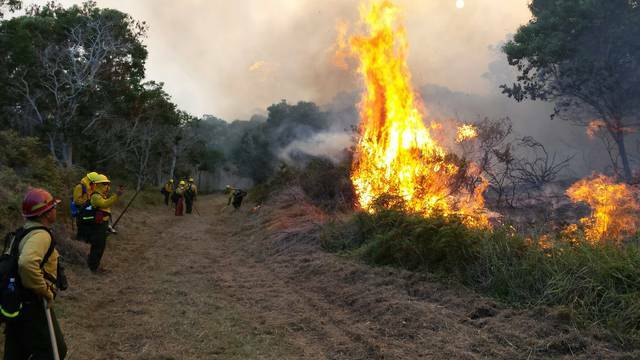 The brush fire that originated at Keauhou Ranch on Hawaii island Sunday morning doubled to 1,495 acres overnight, according to National Park Service officials. Exacerbated by dry, windy conditions, the fire is now mostly within Hawaiʻi Volcanoes National Park, and had consumed 1,250 acres of native forest on both sides of Mauna Loa Road by Tuesday morning. The blaze remains uncontained and is now less than a half-mile from the Kipuka Ki Special Ecological Area, which is home to threatened and endangered native plants and animals. The fire — at the 4,500- to 4,800-foot elevation mark — is moving west towards Kapapala Ranch. No homes or structures are currently threatened, and it poses no threat to the Volcano community at this time.